Facebook’s decline in popularity: A viral research paper doesn’t prove its case. Researchers scored a viral hit with a study using epidemiology to predict Facebook’s demise. Too bad it’s fatally flawed. Eighty percent! The paper rocketed to the top of Reddit’s technology section. For bloggers around the Internet, the headlines practically wrote themselves. An uncritical three-paragraph write-up in Time has pulled in 21,000 Facebook likes and counting. Nothing sells on Facebook like another story about how Facebook is evil, uncool, or—best of all—doomed. I hate to be the Grinch who actually read the paper, but its conclusions are less bankable than Dogecoin. Which is to say, about as solid as one might cynically expect from a paper on epidemiology and social networking published online without peer review by a pair of graduate students in mechanical and aerospace engineering. A) Social networks’ growth can be likened to the spread of an infectious disease. B) In the case of Myspace, the network’s decline can also be likened to the spread of an infectious disease. C) Like Myspace, Facebook has begun to show signs of decline after a period of rapid growth. D) Ergo, Facebook will be dead within three years. Point B is interesting, and less obvious than it might seem. As the authors acknowledge, social networks aren’t like the flu in that there’s no inherently predictable recovery rate. That is, you don’t necessarily join a social network with the expectation that you’ll be over it in a week. So instead of comparing the decline of social networks to recovery from an illness, the authors make an interesting leap. They hypothesize instead that the decline of a social network is like the spread of an illness—that leaving is as contagious as joining. The way they wrote the paper, the authors made it seem as though they arrived at this model a priori, then decided to try it out on Myspace, and voila—it worked! In their words, they “validated” the model by testing it on Myspace and finding that it was a good fit. Ideas, like diseases, have been shown to spread infectiously between people before eventually dying out, and have been successfully described with epidemiological models. Again, this follows intuitively, as ideas are spread through communicative contact between different people who share ideas with each other. Idea manifesters ultimately lose interest with the idea and no longer manifest the idea, which can be thought of as the gain of “immunity” to the idea. “Follows intuitively?” “Idea manifesters?” Come on, now you’re just making stuff up. Sure, some ideas spread infectiously and then die out. Others, like democracy, gravity, and evolution, have shown impressive staying power. Anyway, where were we? Oh right, we’re still on Point (b). In short, if the paper had confined itself to the observation that the decline of Myspace could be modeled using insights from epidemiology, then we’d have no problem. But we also wouldn’t be seeing the piece go nuts on Reddit. Moving on to Point C, things get dicier still. The authors’ conclusion relies on the premise that Facebook is already showing signs of decline. At first glance, the chart below—which was highlighted in several media reports—seems pretty convincing. But that’s very odd, given that the social network has consistently reported massive, ongoing growth in both its active user base and revenue. These widely accepted metrics, it seems, are of no interest to the paper’s authors. Instead, they pull their data exclusively from Google Trends, which measures the number of Google searches for a given keyword over time. In other words, the researchers’ claim that Facebook is faltering is based entirely on an apparent dip in the number of people typing “Facebook” into Google in 2013. They justify this bizarre choice of proxy data by arguing that it’s “advantageous compared to using registration or membership data,” which can include inactive members. OK, then why not use daily or monthly active users, as industry analysts do? Seemingly unaware that Facebook is a public company, the researchers claim that user activity data on social networks is “typically proprietary and difficult to obtain.” They back up this assertion with a rather amusing citation: a study published in 2009 about—you guessed it—Myspace. The Google Trends data on searches for Facebook, unfortunately, do not appear particularly reliable: There’s a huge spike in October 2012 that the researchers can’t really explain and end up simply throwing out. Yet they have no such qualms about an apparent dip in 2013. In fact, that dip is the key to their paper. 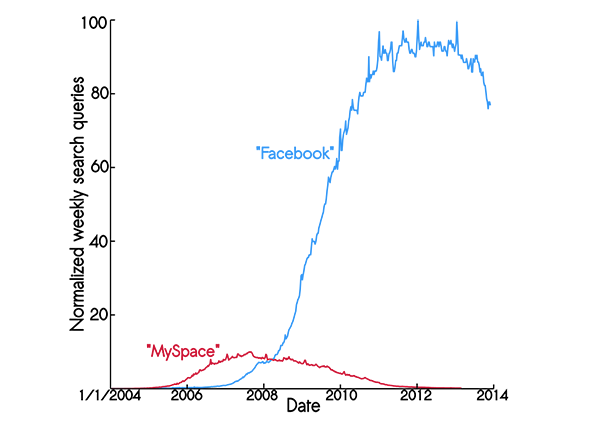 If Facebook isn’t actually declining in popularity, then the Myspace model doesn’t fit. The authors never entertain the possibility of an alternative explanation for a dip in the Google Trends data. Facebook’s numbers show that its users migrated en masse from using the site on a desktop computer to accessing it via their phones and tablets in 2013, often via the mobile app. The paper makes no mention of this trend—nor the even simpler possibility that people aren’t searching for “Facebook” as much on Google because they already know what it is and where to find it. By the authors’ logic, I guess a Google Trends search for “broadband” would suggest that high-speed Internet began to wane in popularity sometime around 2005. Which brings us to Point D, in which the authors finally “prove” the very thing that they assumed from the outset: that all social networks can be expected to follow the same trajectory as Myspace. They even admit in the section describing their model that it doesn’t work unless you assume that all social networks eventually decline. It’s an old journalistic trick: Just add the words “research” or “study” to a sensational claim for instant credibility. Best of all, you’re absolved of any responsibility for verifying its truth, since everyone knows journalists aren’t qualified to dispute scientific findings. Funny thing, though: If it hasn’t been peer-reviewed, and journalists aren’t qualified to dispute it, then what’s to stop it from simply becoming accepted as truth?